I’ve been growing my hair out, and it’s finally long enough to do something with. Read this as “I wear my hair in a ponytail every single day, and I need to do something else!” Fishtail braids are so hot, and so popular, and show no signs of slowing down. Wanna know a secret? They’re also pretty easy to do. Once you master the movement, and re-train your brain, there’s practically no stopping you! 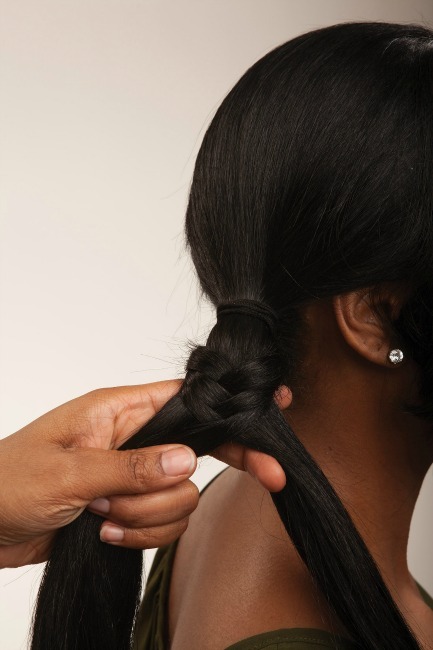 This is the braid that will take you from an amateur to a braiding professional. The Basic Fishtail is one of the most coveted braiding skills, but I promise that you’ll be able to handle it. Once you master this braid, it’ll open the doors for so many different styles and variations. 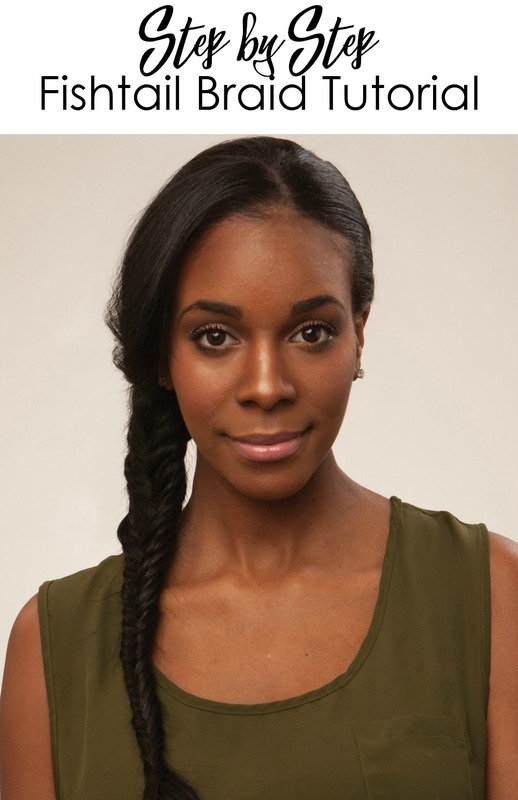 The fishtail braid looks good on wavy or straight hair. Straighter hair lends more detail to the intricate elements of the braid. The smaller the pieces you take, the more precise the braid stitches will look. 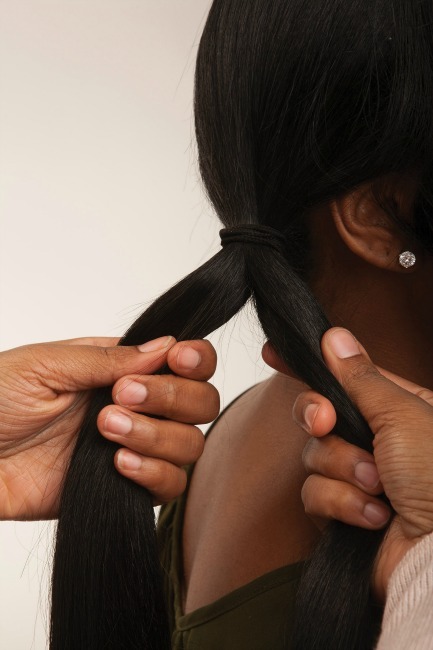 While braiding, make sure that you don’t pick up pieces that you just crossed over, or else it won’t have the same effect. You’ll impress your friends, dates, parents, local barista, and pretty much everyone wherever you go, who will want to know how you did it. And, despite its delicate look, this braid will last until you decide to take it out. 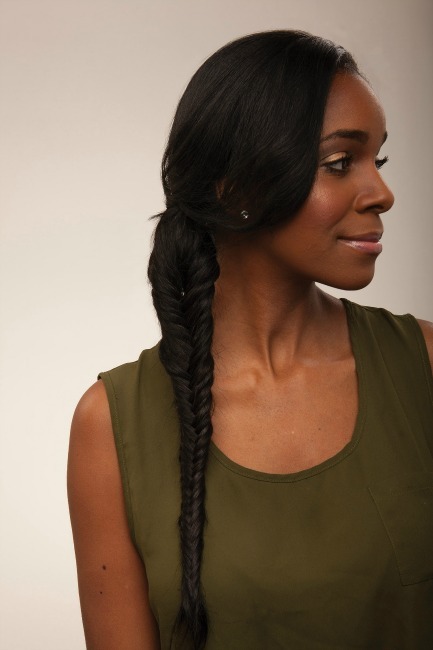 The Basic Fishtail can be created on straight, wavy, or loosely curled hair. For more detail, use straighter hair. Blow-dry the hair straight with mousse, thermal setting spray, and a flat styling brush, like a paddle brush. Use a flat iron to create extra-straight locks. 1. Section out your bangs. 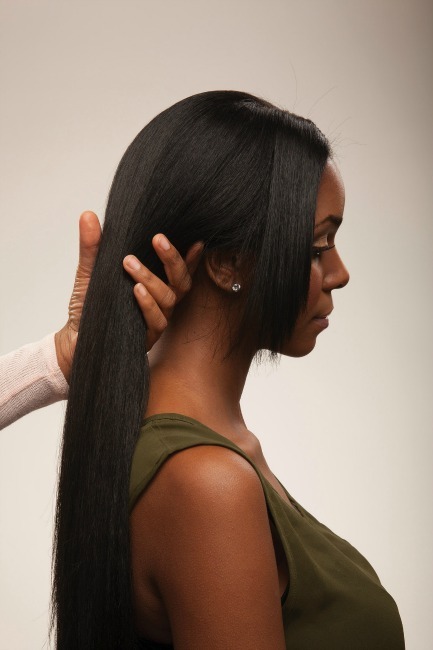 Brush remaining hair to one side and gather into a ponytail. Secure the ponytail with a hair-colored elastic band. to smooth hair and reduce flyways. 3. Take a piece from the back of the left section around and over the left section, and place it into hair of the right section. and over the right section, and place it into hair of the left section. 5. Repeat, alternating left and right, and watch the beautiful fishtail pattern form. Make sure to hold each section firmly. 6. 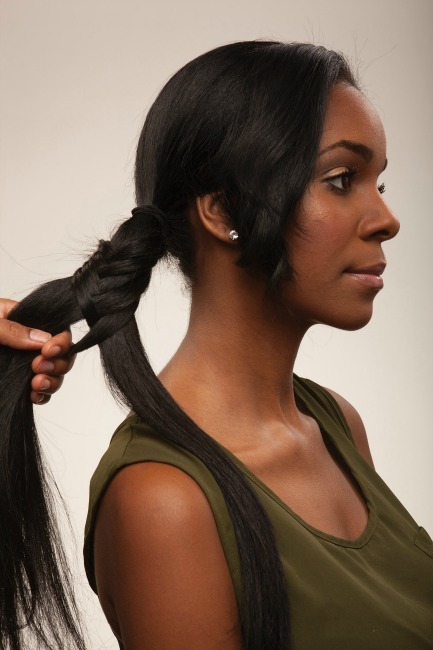 Stop braiding a few inches from the ends. Hold the bottom of the braid with a clip. 7. 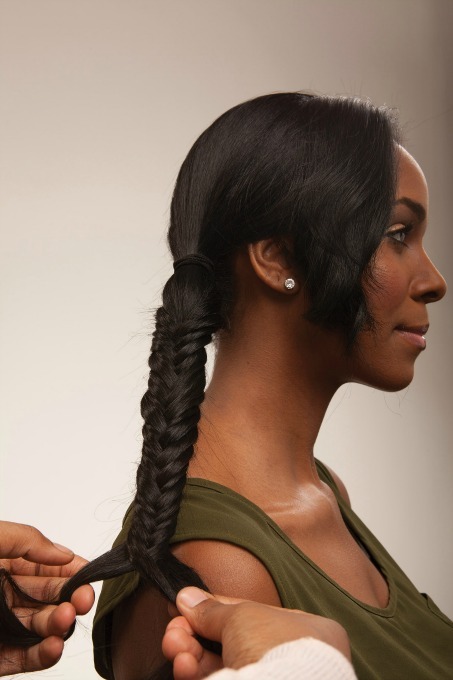 Loosen the fishtail by gently pulling on the outside of the braid. This is called pancaking. It creates more width and texture, making the braid look more fashionable. 8. Remove the clip from the bottom of the braid. Tie off with a hair elastic that matches your hair color. If you think your hair will hold the braid, a fun option is to spray it with super-hold spray instead of using an elastic. Voila! 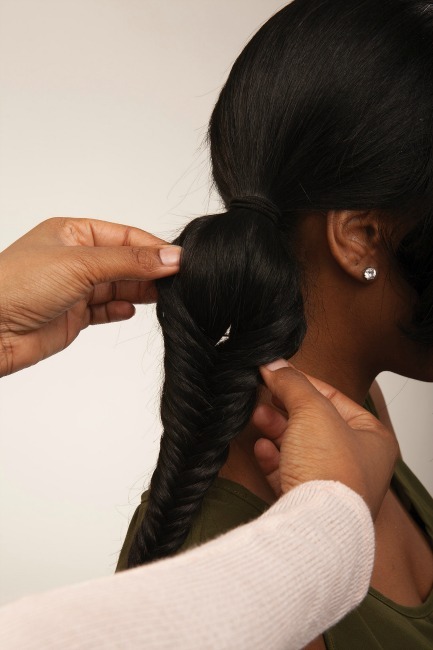 See how easy it is to accomplish the basic fishtail braid technique. It really looks a lot more difficult than it is, which is part of the magic.